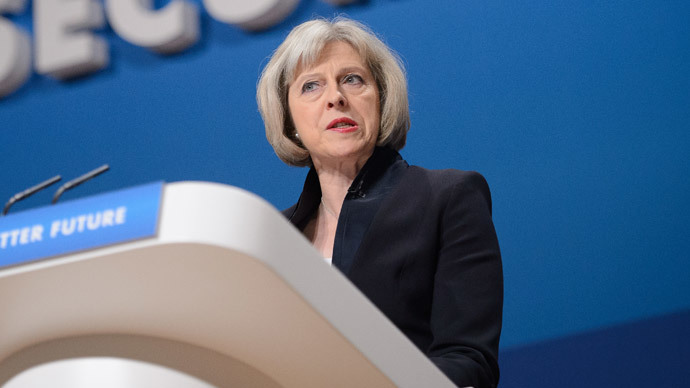 UK Home Secretary Theresa May has given her full support to the Communications Data Bill, colloquially known by its critics as the Snoopers’ Charter. She claims without it security agencies are unable to fully protect the public from terrorist attacks. Giving her response to the Paris attacks in the House of Commons on Wednesday, May said it was imperative that surveillance agencies were able to intercept communications “where it is necessary and proportionate to do so” to monitor terrorist activity. She also outlined further security measures put in place prior to and following the attack on satirical magazine Charlie Hebdo. May acknowledged that during the time of the attack the government was reviewing the bill, and said that without the immediate implementation of the bill the security forces’ power was diminishing. “Every day that passes without the proposals in the Communications Data Bill, the capabilities of the people who keep us safe diminishes,” she said. The LibDems made a move to block the bill in 2012, with Clegg saying no government would be able to store people’s personal correspondence while he was in power. May used her speech in the Commons to reinforce the importance of the measures, saying the lack of cross-party consensus was hindering the implementation of the bill. She further said its label as a “snoopers’ charter” was a misnomer. “This is not – as I have heard it said – ‘letting the government snoop on your emails.’ It is allowing the police and the security services, under a tightly regulated and controlled regime to find out the who, where, when and how of a communication but not its content, so they can prove and disprove alibis, identify associations between suspects, and tie suspects and victims to specific locations,” she said. She added that “it was likely” that such data was used during the Paris shooting, and said it was entirely necessary that UK security organizations have access to this data to prevent similar attacks. During her speech, the Home Secretary reiterated points made previously by Prime Minister David Cameron and other senior figures in the wake of the Paris attacks.